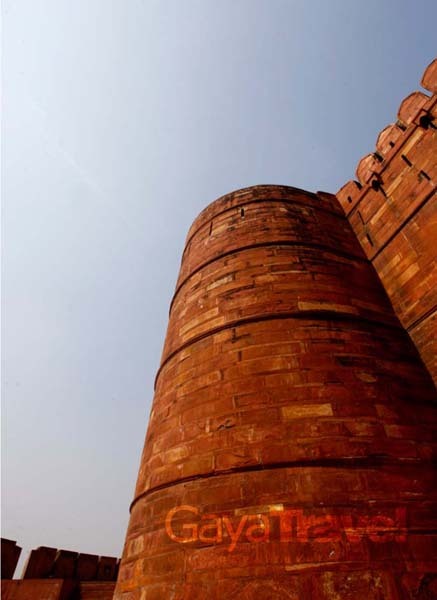 AGRA is where the iconic Taj Mahal is located. 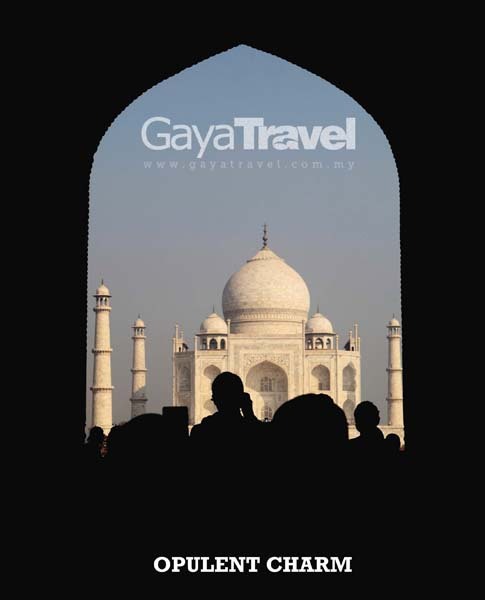 Taj Mahal was one of the main reason why we chose India as the destination of choice. After travelling quite far, we gladly found that Taj Mahal did not disappoint. It was all that we imagined it to be… and more. The drive to Agra from Delhi was around five hours. The Indian countryside was beautiful. Fields full of blooming yellow mustard flowers with sights of horse-carts and camel-carts carrying big loads of hay took our breath away. We also learned that time that camels actually originated from India. To survive the five-hour driving, we suggest that travellers should keep their eyes open all the time and keep their sense of some sense of humour intact. We noticed there were many lorries bearing the words “BLOW HORN” on their backs, which led us to think that those words might be the name of the lorries’ company name. Later, we found out that it was actually a friendly reminder to other drivers to honk at them should they obstruct traffic. During the journey, our driver, Mr Jitu, shared with us that drivers in India need to constantly be on alert of oncoming traffic because some drivers tend to approach from the wrong side of the road (read: vehicle from opposite direction approaching you on the same lane). That bit of information mentally prepared all the four of us travelling women – we did not scream on top of our lungs when it happened along the way. We reached Agra at about 10.30pm. The 3-star hotel where we stayed had a revolving restaurant with a view of Taj Mahal, as claimed on their website. We simply couldn’t wait to the great building built in the name of love the next morning. The next morning we were met our local guide at the hotel. After being dropped off at the Taj Mahal Ticketing Office, we bought our 750 Rupees (RM54) ticket and were given a bottle of mineral water and a pair of shoe covers. After that, we proceeded to board the battery-operated bus to bring us to the entrance of the Taj Mahal.Due to the tight security checks, we queued for about half an hour. All around us, we saw excited faces, all eager to get past the Taj Mahal gate. Some foreign lady tourists were even decked in colourful sarees. The Taj Mahal literally took our breath away as we set our eyes upon it. 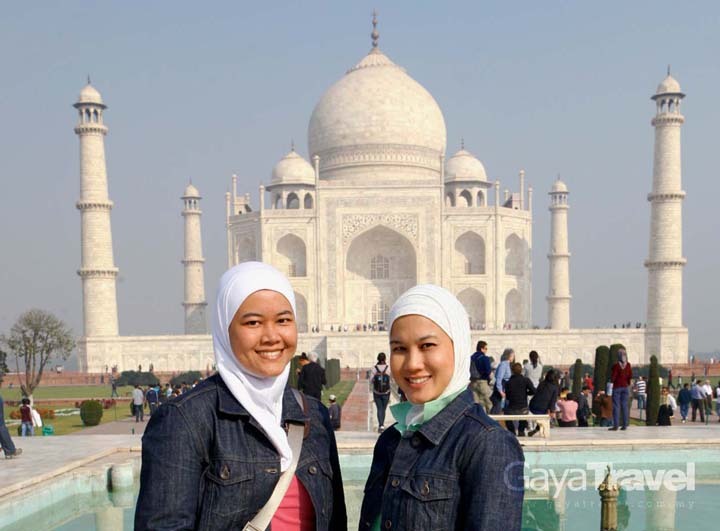 It was a surreal experience for us, having seen countless photos and on-screen images of the world-famous monument. Indeed, Gaya Travellers have arrived.It was crowded. It somewhat reminded us of Disneyland. Tourists eagerly took turns in getting themselves photographed on the benches scattered around Taj Mahal’s compound in Bollywood-inspired poses.The Taj Mahal was intricately decorated with carved inlaid imported precious stones. Only the finest craftsmanship and materials were used. No photography is allowed inside the building, in respect of the late Mumtaz Mahal. After all, Taj Mahal is a mausoleum. 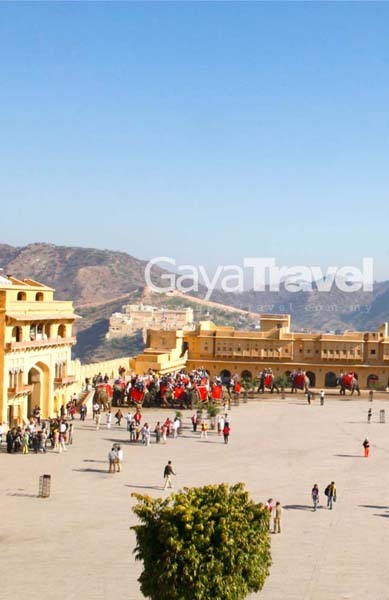 Though our intrigue towards Taj Mahal was the one that spurred us to travel to India, Gaya Travellers find that our favourite destination throughout our Indian experience was Jaipur. It is a labyrinth of fascinating bazaars, opulent palaces and historic sights. Jaipur offers the chance to see medieval structures jostling for attention alongside the modern ones. Often called the Pink City due to the colour wash, Jaipur’s old walled area contains the City Palace Museum, a medieval astronomical observatory and bazaars. 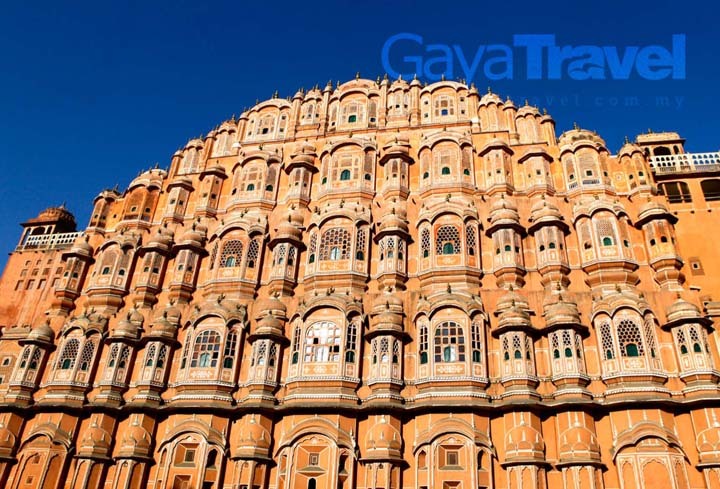 The myriad-windowed pink Hawa Mahal or the Palace of Winds is a focal point of Jaipur.There is something romantic about Jaipur that we could not put our finger on. Its traffic is chaotic like Delhi, but the people of Jaipur do not seem to be in a perpetual rush. The city is somewhat more relaxed, compared to Delhi. Even when our van was hit by a motorcycle, our driver seemed unfazed, except for us women! We find Amber Fort impressive. It is, after all, a fort, where the Maharajah and his big family lived and spent most of their time. One could easily imagine how good the Royals had it back then – the Amber Fort was impressive, with its majestic architecture and intricate workmanship.Perched on top of a hill, the Amber Fort overlooks the stunning vistas of Maota Lake and its surroundings. There are three ways to make your entry to the Amber Fort: you could board a jeep; ride an elephant or simply walk. The elephant ride was the most popular among the three. Gaya Travellers chose the jeep, while our fit friend Tuty decided to walk. We arrived about the same time – our guide who insisted she board the jeep was surprised. The Amber Fort was lively, with elephants ferrying visitors, musicians playing their traditional flutes, peddlers selling souvenirs.Our guide was well versed in the history and the architecture of the fort, so the trip was all the more enlightening. The entrance fee is 200 Rupees (RM15). We only passed by this iconic building of Jaipur. But we read that you can climb up the winding ramp to the top of this five-storey high building. Hawa Mahal is surrounded by bazaars. Would be nice if we had the chance to go and shop at the bazaars. According to our guide, this was where the ladies of the Royal household sat and observed the town’s happenings. They were not allowed to roam freely on the streets. There are many small windows for these ladies to peek through. There are a few galleries inside the museum – Chandra Mahal, the Textiles and Costumes Gallery, Sabha Niwas, Arms Gallery and Transport Gallery.Chandra Mahal has seven storeys, each luxuriously decorated with paintings, floral decorations, tiling and mirrors. Portraits, art collections, enamelware, weaponry, carpets and furniture are on display.Textiles and Costumes Gallery is where fashion buffs should head to. The materials and the design were luxuriously upscale, the type where even the Queen of England herself would not be able to compete. Not even Elton John, Liberace or Malaysia’s very own Datuk M. Daud Kilau. Yes, the Maharajahs of yore were big on tasteful bling. There is a souvenir shop here where you can buy high-quality clothing, jewellery and household decorations. Sabha Niwas is an assembly hall, where royal receptions and ceremonies were held. 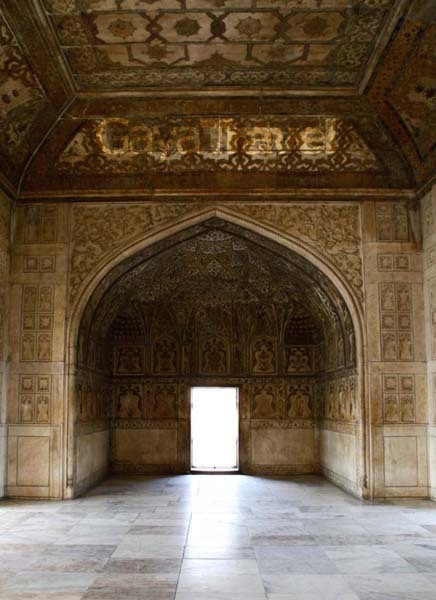 The walls were painted using colours made of crushed jewels and gold leaves. Many awesome artefacts are housed here – Gaya Travellers were already tired from saying too many wows at this point. Arms Gallery showcases many weapons belonging to the great Maharajahs. There were not only deadly but beautifully decorated too. Transport Gallery houses chariots, carriages and other Royal modes of transport.There is a bazaar outside the museum – not much choice, but sufficient enough for a quick browse and shopping. The Gaya Travellers were never big on sciences, so our trip to Jantar Mantar was a short and brief one. Astronomy lovers would love the place. It looks like a theme park, where 16 instruments are housed. 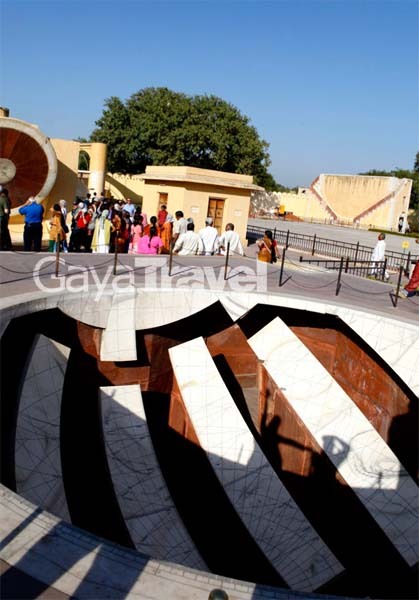 These 16 instruments include a sundial that can accurately tell Jaipur’s time up to the accuracy of 20 seconds; a sundial to forecast the crop prospects for the year; and 12 instrument pieces whereby each represents one of the 12 zodiacs. The instruments and compound were very well kept and costs 100 Rupees (RM7) to enter. 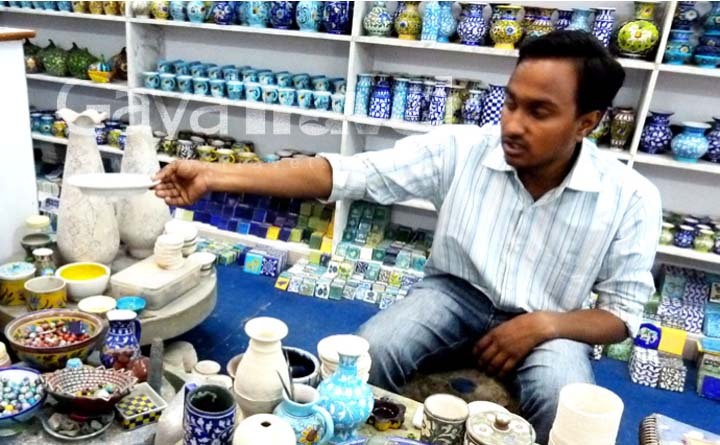 We did not get the chance to shop much during our trip, but the guide and driver accepted our request to stop by at a pottery shop that sold Jaipur’s trademark craft, the blue pottery. 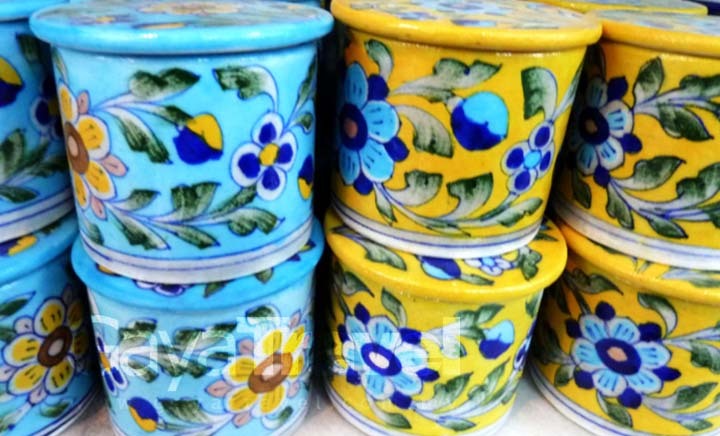 This item is indeed a must buy and comes in the form of tiles, fridge magnets, jewellery, cabinet knobs, decorative plates, mugs and other knick knacks. We have thoroughly enjoyed our Indian adventure. The experience was a good mix – we went to big cities, small towns, mountains, places of worships, historical sites – proving that India has a lot to offer. People kept saying it’s dirty, but we think that the country has really cleaned up well. Maybe that was because the Commonwealth Games had just finished when we arrived. But we do hope that the cleanliness remains the same (or more improved) for many years to come.We read that MATTA is planning to heavily promote Kashmir as a tourist destination for Malaysians and we strongly agree. With Malaysia Airlines and Air Asia adding more Indian destinations in their offerings – we hope that more Malaysians are able to experience India. Our trip was indeed an eye-opening experience and we conclude that India is truly as what it claims: INCREDIBLE!